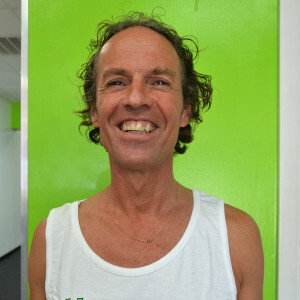 Didier started practicing yoga asanas as a teenager in Casablanca, Morocco, where he grew up. He also spent ten years living in monasteries in India, France, and the United States. Didier is presently certified through the Sivananda and Sri Mahesh Schools of Yoga. In 2000, Didier created his own yoga school, “Two Suns Rising Yoga.” His school offers the richness of his experience through ashram life as well as his participation in various yoga trainings. These, along with his keen interest in the mystical and multifaceted field of yoga renders his yoga comprehensive and unique. I love the gym because of the members who come to my classes. I’ve also known Vince for many years and he has been the easiest person to work with. My favorite food is eating anything healthy!